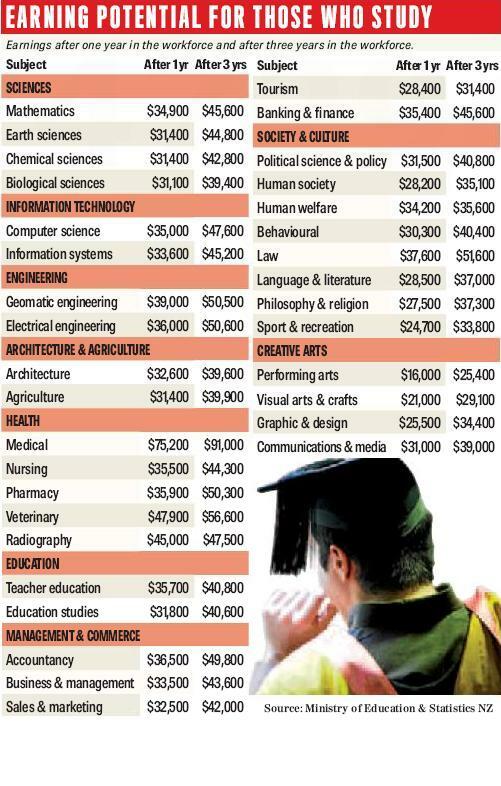 The Sunday Star Times has compiled a table (see below) of university degrees and what graduates from these degrees can expect to earn after a year and three years in the workforce respectively. Not surprisingly, science, health and engineering graduates have much better earning potential than those working in tourism, architecture, agriculture, sports, creative arts and teaching. However, what would be really interesting to see are some statistics over a longer timeframe – say after 10 years in the workforce. While those who studied medicine and veterinary science are well underway with their careers by that stage and probably earning six figure salaries, what of scientists? Anecdotal evidence suggests the gap starts to narrow for workers the longer they are in the workforce, with the early gains scientists enjoy starting to level off mid-career. That would appear to be why a large number of scientists complete their training, do some lab work or field research and then head overseas. I doubt these figures are that compelling to those high school leavers mulling over their options and yet to apply to a course at university. They are more likely to pursue what they are passionate about or go for a catch-all degree like “business and management” or “political studies”. Everyone expects to earn a meager salary in their first few years of work – I was scraping $40,000 after two years as a journalist, but the real question is how much you are likely to be bringing home after five – ten years when you’ve possibly got a mortgage to pay and an ankle-biter or two running around. Anyone doing the sums then, say for journalism ($50,000 – $65,000) would probably give the profession and its training a miss. Does the same go for science?